I spend my days surfing the frigid waves of Ocean Beach, San Francisco, turning data into beautiful images, and dreaming of beers unborn. I’m a recent graduate of the University of California, Berkeley with a PhD in ant ecology and a love for statistics. I first brewed beer with a housemate sometime around 2011 and really got into it through the creation of QMB in 2015. I have made a lot of beer in the past several years. Kölsch is my favorite style to brew as I enjoy lighter beers and the yeast imparts a character you can't find in other styles. QMB is the best project I have participated in EVERRRR. The technical aspects and science in brewing appeal to me and feel more participatory than going to a bar. I'm so grateful that we have been successful. It feels good to make something I like to drink and to diversify the brewing industry at the same time. Queer culture is so vibrant; it pairs very well with the diversity of beers and creative side of brewing. EMMA WILLIAMS - Events coordinator, camping planner. EMILY HEARD - Educational Brew Day coordinator. 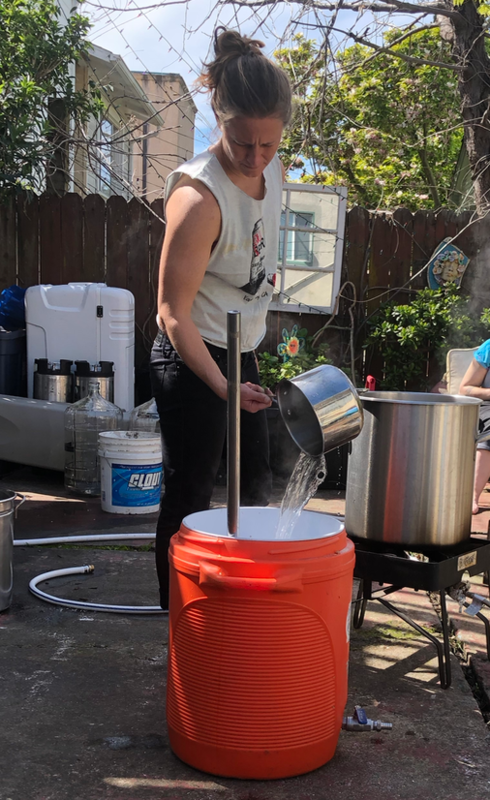 BECK H. - Brew Day and Events organizer. Kate Summerill - Co-founder, Vice President, Head brewer in Bend, Oregon.